This whole Domino’s pizza controversy got me thinking. And experimenting in the kitchen. And baking. And eating. I won’t weigh in on the Domino’s debate as it’s been hashed-out, bantered around, discussed, argued about, and solved at this point. If you’re interested in a rundown, there have been plenty of gluten-free bloggers dishing up the details. If you stopped by hoping to see who won the two cookbooks I featured last week (cookbook #1, cookbook #2), the winners haven’t been chosen yet. I plan to give away a few more books over the next two weeks to promote May as Celiac Awareness Month, so stay tuned. I’ll do a final post to wrap things up and announce the winners soon (hopefully the first week in June). In the meantime, let’s celebrate with gluten-free pizza. 1. Preheat oven to desired temperature (according to pizza crust directions). Udi’s directions call for a 375 degree oven. Place macadamia nuts in a food processor and pulse until finely ground. Don’t over do it, or you’ll end up with nut butter. 2. Add basil and garlic to processor and pulse a few more time to mix the ingredients. 3. Slowly add the lemon juice and olive oil and continue pulsing. Scrape down the sides of the processor bowl with a spatula to insure even mixing. 4. Add the Parmesan cheese and pulse again. Season with salt. 5. 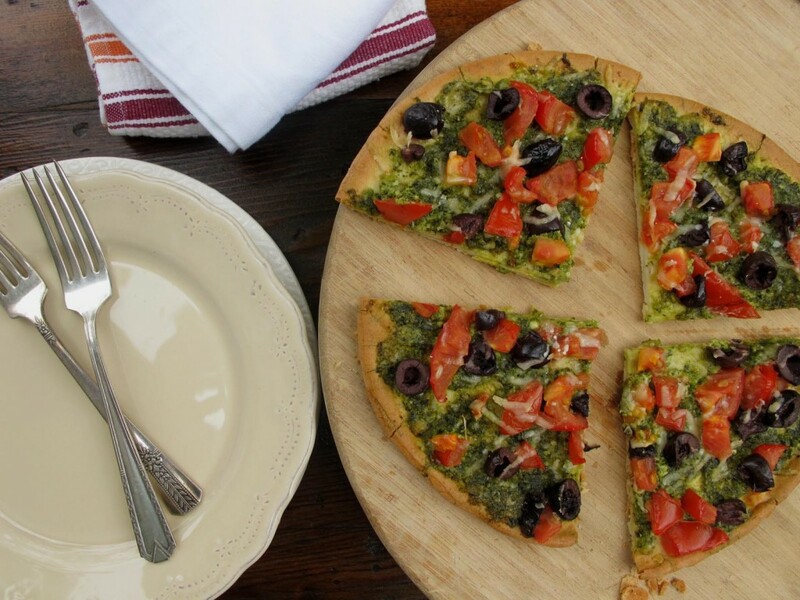 Lightly spread a light, but even layer of pesto on a prepared gluten-free pizza crust. 6. Top with tomatoes and olives. Sprinkled with a small amount of freshly grated Parmesan cheese. 7. Bake for 10 to 15 minutes, or according to crust directions. Pizza should be lightly browned with cheese melted. 8. Remove from oven, let pizza rest for a couple of minutes, slice, and enjoy! Note: store the remaining pesto in an airtight container in the refrigerator. It’s delicious on gluten-free pasta, roasted chicken, or crackers. If you’d like to try making your own crust, Alta at Tasty Eats at Home has a fantastic quinoa pizza crust recipe. I’ve also been experimenting with oat flour to make pizza crusts. I haven’t quite perfected my recipe yet, but there’s a lot of potential with oat flour. Check Gluten-Free Prairie for product details. These are the same wonderful oats I’ve always been in love with. Plus some other surprises. Stay tuned. Peace, love, and homemade gluten-free pizza! This entry was posted on Wednesday, May 23rd, 2012 at 9:12 am	and is filed under Celiac & Gluten Intolerance, Gluten-Free Recipes. You can follow any responses to this entry through the RSS 2.0 feed. You can leave a response, or trackback from your own site. Ooh, love the macadamia nuts! No wonder I thought it was broccoli LOL. Looks delish. Another great way to bake pizzas is on the grill with a pizza stone. Works on getting a crispy crust every time! Thank you for mentioning my pizza crust. And I’m surprised, Melissa, because these toppings seem so…normal for you! No beet greens? No enchilada sauce? I do love your pesto though. The idea of using macadamia nuts sounds amazing. I’ll just leave out the parm and I’m sure it’ll still be decadent and delicious. 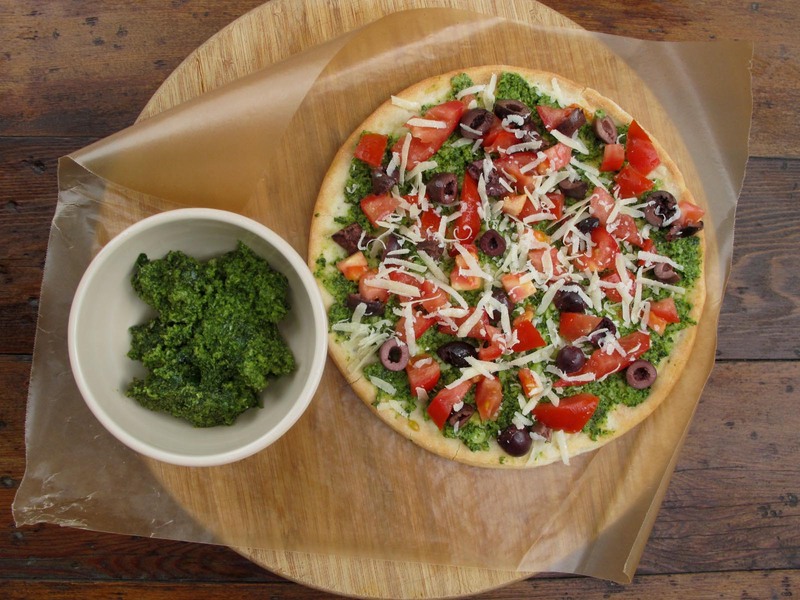 Did you know that pesto pizza is one of my favorites! I need to make it again – with mushrooms – yummy! I’ve cut out the gums in those quantities that gf recipes use, but Carol Fenster’s pizza crust recipe is awesome if you tolerate gums. This looks so colorful and I know it’s healthy if it comes from Melissa, so I’m trying this one real soon! Mmmm, we make pesto pizza all the time! But we’ve never tried using macademia nuts! More inspiration from Melissa Can’t wait to see your crust! Wow, this pizza looks amazing! Can’t wait to make it. Thanks for those links to the gluten free pizza crust recipes too- it’s always good to have options!